Nutritional support to meet horses’ increased respiratory requirements in winter. Daily allowance: 10 ml, 2 to 3 times per day for 8 days. 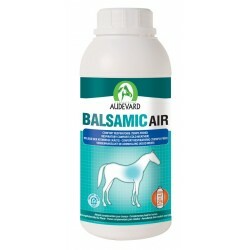 BALSAMIC AIR can also be sprayed in the surrounding air. Raw materials : Sorbitol, potassium chloride. Additives : 2b - Aromatic substances: Paperbark (Melaleuca viridiflora - EO) 5460 mg, rosemary (Rosemarinus officinalis - EO) 5460 mg, eucalyptus (Eucalyptus globulus - EO) 5460 mg, Norway pine (Pinus sylvestris - EO) 5160 mg, terpineol 5152 mg, thyme (Thymus vulgaris— MT) 1,360 mg. Analytical constituents : Humidity 96.3 %, crude protein 0.8 %, raw fats 0%, crude ash 0%, crude fibre 0 %, sodium 0.003 %.